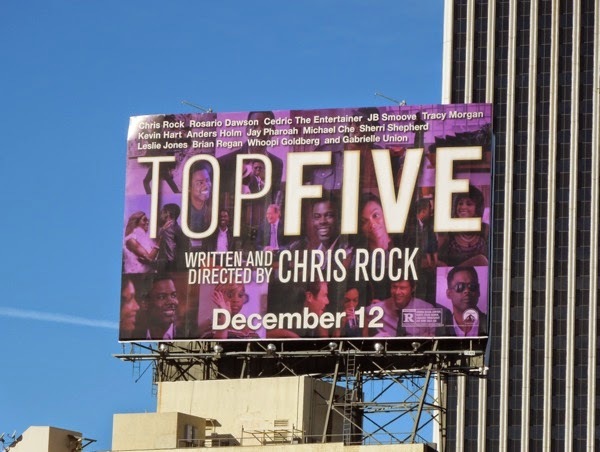 What better way to mark the fifth of December than with this billboard campaign for Top Five, the new comedy drama written, directed and starring comedian Chris Rock. The much buzzed about semi-autobiographical movie tells tale of a New York City standup comedian-turned-film-star (Chris Rock), with a fading Hollywood career and a reality star fiancé (Gabrielle Union), who feels typecast in his work and unsure about his imminent marriage. 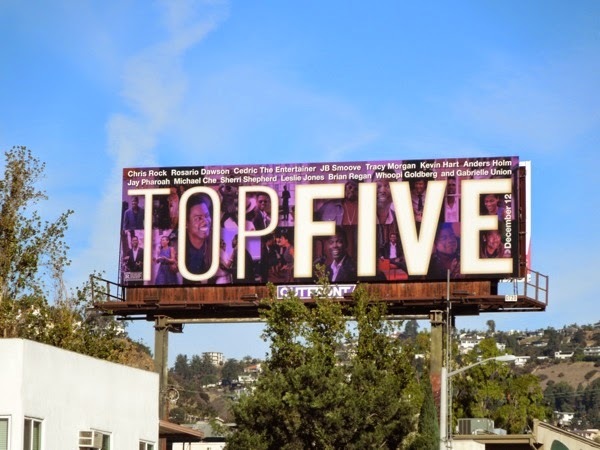 Following a chance encounter with a journalist (Rosario Dawson), she who travels with him to his old neighbourhood where he discusses his 'Top Five' rap artists with his pals, and in the process of his journey he confronts his past career and life choices. 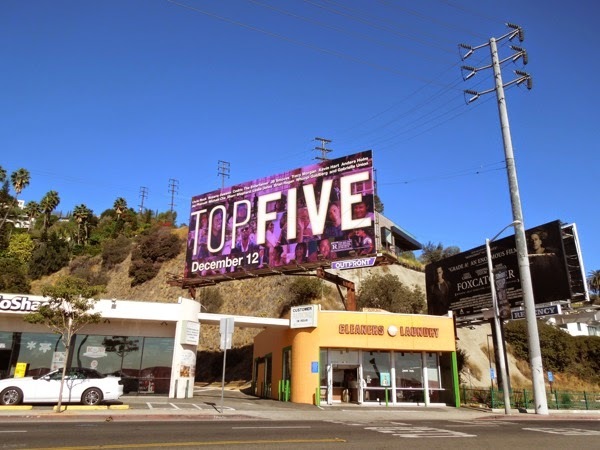 From a distance you can't tell what these Top Five billboards are for, is it a movie, is it a TV show or a Las Vegas nightclub event, but one thing is clear, they stand out. 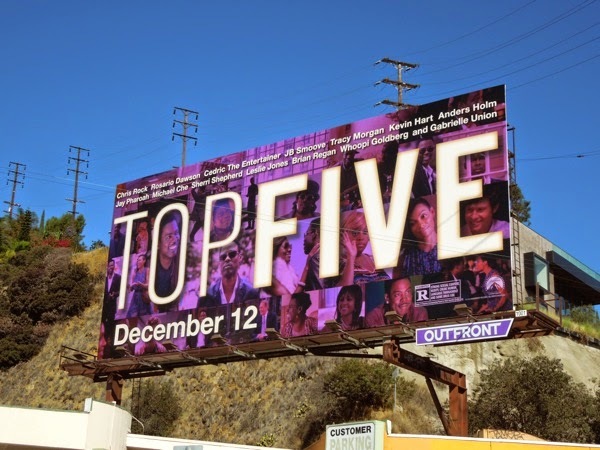 These montage billboards featuring a jam-packed movie cast were spotted along Highland Avenue, Wilshire Boulevard, Fairfax Avenue and Sunset Boulevard from November 26 to November 28, 2014. 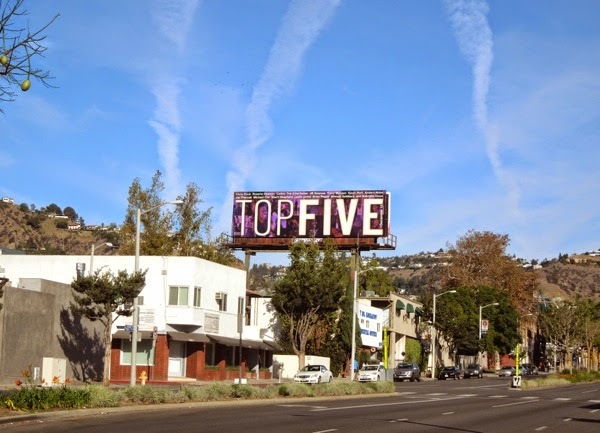 Just to hijack this blog entry, what would your top five billboards of 2014 be? 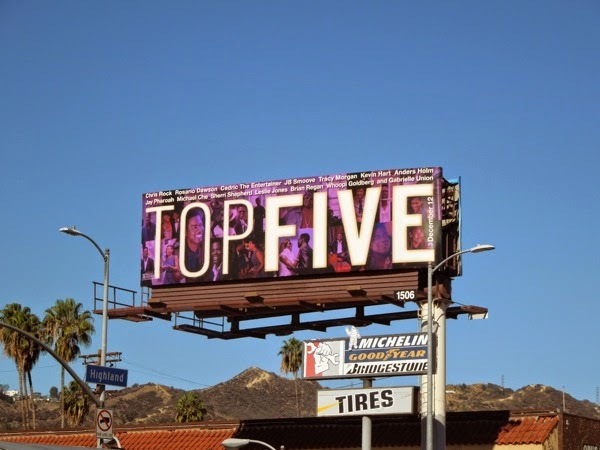 Let Daily Billboard know your favourite outdoor ad creatives from this past year from the worlds of fashion, film, TV, drinks, technology, cars and more besides, because the BAB Awards are fast approaching.